First step was to draw the branches of our tree on the ceiling. A single support post existed off center in the space, which needed to become a tree growing up in the middle of the “tent”. Design Associate Beth Grace found a company that makes natural bark post covers to wrap the post giving us a real tree trunk. 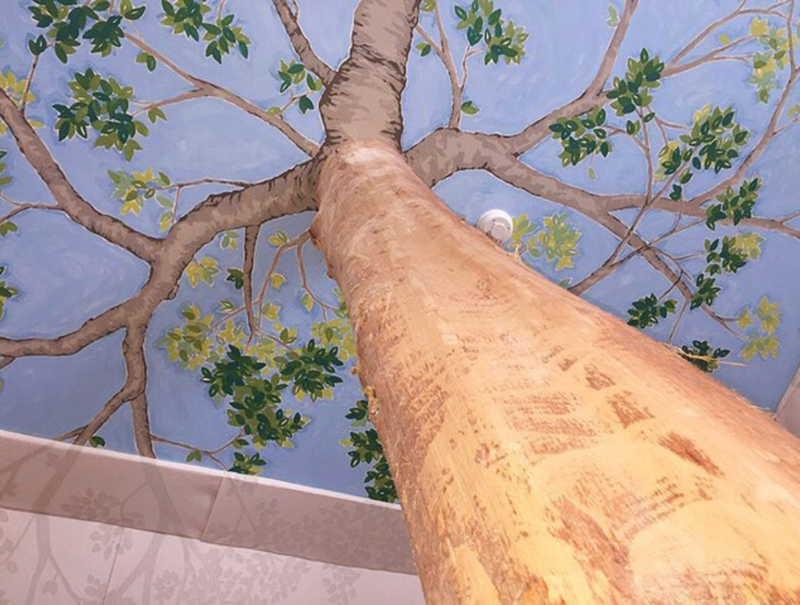 We then worked with Art and Atmosphere muralist, Ardis Barrow, on an original ceiling mural that continues the image of the tree up onto the ceiling -- into the sky with painted branches and budding spring leaves. Our camp tent ceiling needed to open in the middle, allowing the tree to grow up through the center. Fabric wizard, Toni Massery, installed 160 yards of cotton canvas duck treated with flame retardant, tenting the ceilings and walls of the entire space (phew!). We added 11 iron camp beds dressed in lumberjack plaids to complete the summer camp effect. It’s now ready for mid summer visits to the Berkshires by many Boston friends with kids. Photos of the finished bunk room coming soon. Getting the exact shade of blue for the sky in the right value was important. Our color combination needed to feel like a blue sky on a sunny, warm day. At the intersection of where the tree grows beyond the tent and the branches continue, Art & Atmosphere completed the trompe-l’oeil effect by painting the shadow of the leaves and branches onto the canvas duck. This supports the illusion that the tree is much larger than the room.